Jada Pinkett-Smith, Michelle Obama, Alicia Keys, Jennifer Lopez and Lady Gaga took to the stage at the Grammys on Sunday night as female artists delivered a riposte to the idea that women needed to ‘step up’ to win awards. PROFILE: The Guardian, formerly known as The Manchester Guardian (founded 1821), is a British national daily newspaper in Berliner format. Sister papers include The Observer (UK Sunday paper) and The Guardian Weekly (distributed internationally), as well as a large web presence. It is now owned by the Scott Trust, via the Guardian Media Group. The paper identifies with centre-left liberalism and its readership is generally on the mainstream left of British political opinion. The newspaper's reputation as a platform for liberal and left-wing opinions has led to the use of the epithet "Guardian reader" as a label for people holding such views. 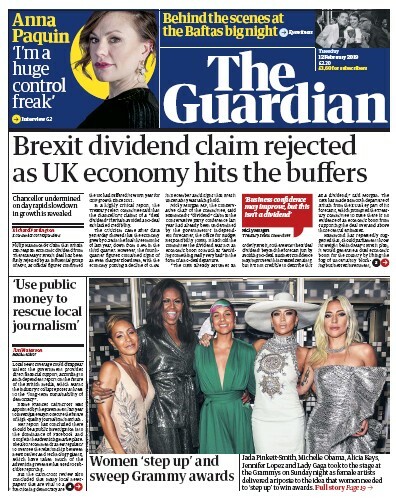 Financially, the Guardian has consistently made large losses in recent years despite the popularity of its online version. Profile extracted from Wikipedia and used under the Creative Commons Attribution-ShareAlike License. Circulation: 263,907 (April 2011) Political Outlook: Centre-Left, Liberal See our UK Newspaper Guide. The Guardian newspaper from UK is available through PressDisplay.com where you can browse and read hundreds of full content premium newspapers and magazines from around the globe. With a subscription to PressDisplay.com, users gain access to full print versions of newspapers on the day they are published.